India’s largest bank – State bank of India (SBI) had recently cut its Home Loan rates. This is lowest home loan rate in the market as of today. The new Home Loan rates are effective from August 7, 2012. 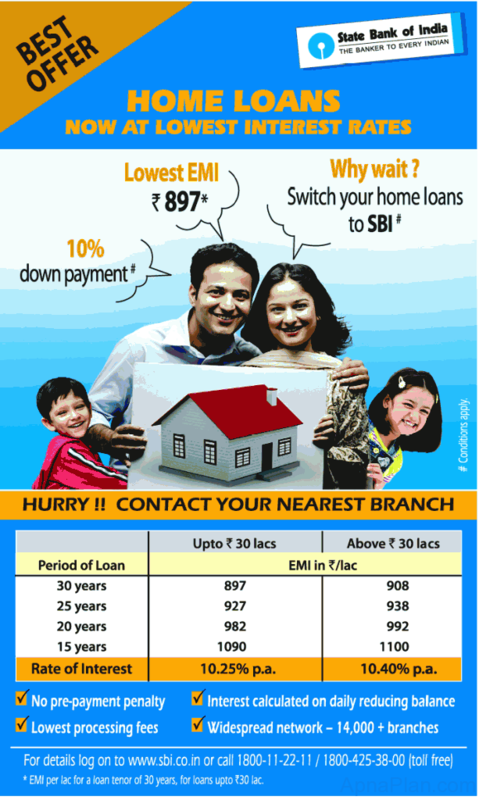 The rate of interest is 10.25% for Home loan up to Rs. 30 Lacs and 10.40% for loan above Rs. 30 Lacs. Here are how EMIs work out per Lac for different tenures of 5 – 30 years. Below is the table showing EMI per Lac for different Home Loan providers for tenure of 5, 10 , 15 and 20 Years. This EMI is for loan amount of up to Rs. 30 Lacs. Disclaimer: We have tried to keep interest rates up to date, but as these change frequently you are advised to check with the home loan institutions before going ahead. Also it would be great if you can point out any errors through comments or email! Please calculate my EMI for 20 years when I am getting loan of below 15 lac, where Govt of India gives 1% sub vation in interest.